"Sonic + Donkey Kong + Yoshi = Tembo"
Game Freak is remembered mostly for the Pokemon franchise, but they have been dabbling with non-Pokemon projects lately. There was HarmoKnight on the 3DS, but they never branched out to other systems besides Nintendo ones till now. 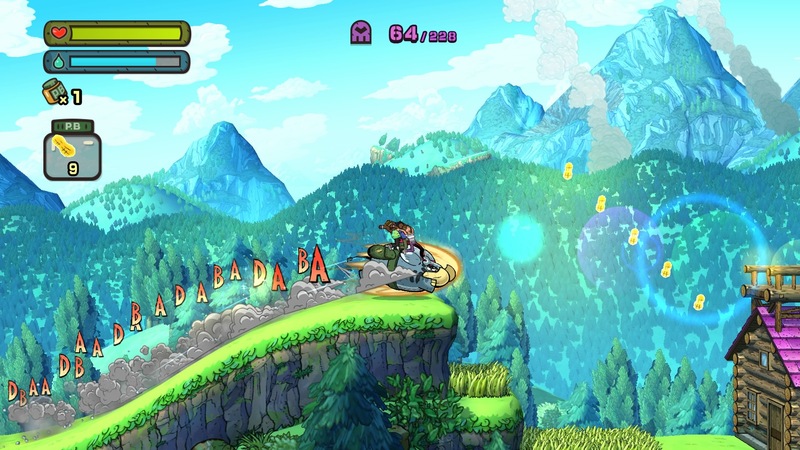 Published by Sega, Game Freak's latest effort is called Tembo the Badass Elephant. Tembo has similar gaming philosophies to Sega's flaship mascot Sonic the Hedgehog in terms of having momentum to go really fast, but it also has other elements from Nintendo characters such as Donkey Kong and Yoshi. Combining those elements to into this platformer is quite a sell based from nostalgia alone, but is Tembo badass enough to live up to those characters? The storyline is pretty straightforward where an evil army named PHANTOM is taking over the world and it's up to Tembo to take them down along with rescuing hostages along the way. Tembo's moveset is minimal yet simple. The dashing through obstacles and enemies is reminiscent of Rambi from the Donkey Kong Country series and there's even cannons that blast it to one area to another that reminds me of those monkeys as well. 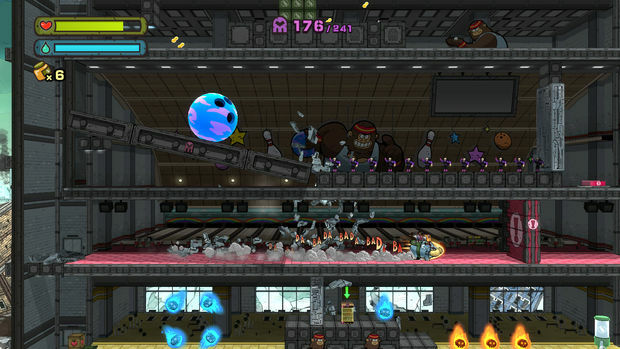 Tembo also has a slide, jump roll attack, ground pound, a Yoshi-style flutter jump and spraying water at obstacles with fire or electricity along with causing certain platforms to appear. Controlling an elephant rampaging through hundreds of enemies is pretty satisfying and I rarely had to fight the controls unless I'm in a tough platforming section near the end of the game. The primary goal in the levels for Tembo the Badass Elephant are to kill every PHANTOM enemy and rescue every hostage. Most of the enemies and hostages can be found by going the regular linear path, but there are hidden areas to explore in the majority of the levels for the tougher to find enemies and hostages. There is a kill count requirement to progress to the dome levels at the end of each zone that conclude in a boss fight, so killing as many as you can is a must. I didn't run into a roadblock missing enemies to unlock those levels unlike others that played it, but I can see why it's the game's main problem for them when they have replay levels to up their kill counter. While Tembo is all about going fast against the opposition, exploration is still heavily encouraged like the Sonic franchise to 100% the game. The PHANTOM army does offer diversity to challenge Tembo from tanks, robots, helicopters and grunts with flamethrowers or electric beams. The mix of some of the tougher enemies gets really nasty at the end of the game upping the difficulty, but it's about finding strategic opportunities to come out of them with minimal health loss than going reckless like an ramaging elephant would do. The boss fights are not that hard either, especially the last boss fight, but finding the right attack pattern and then attacking them is pure old-school game design at it's finest. Even one of the boss fights is a throwback to Donkey Kong Country 3 and Yoshi's Island. You'll know what I mean when you play that. All of this combined together with an old-school lives mechanic with collecting 300 peanuts for an extra life, Tembo the Badass Elephant is a love letter to old-school platformers playing homage to the franchises I previously mentioned. The lives is not that big of a deal especially with a generous checkpoint system during the levels, but things will get hairy near the end where lives matter. Losing all your lives in a level makes you restart the whole level again with a new slate of five lives, so it's not that bad of a punishment even though some of the levels are pretty long. Tembo the Badass Elephant boasts a cartoony graphical style that works great for the character and the world. I love seeing the letters whenever Tembo dashes and gets hit. However, there are technical issues with the game's performance. Firstly, the initial load time to start up the game is the longest load time I witnessed since the last generation of console games' load times without installs. The framerate does run consistently at 60 fps, but it will dip when things get hectic in the game screen for Tembo and the opposition. The music is alright but nothing special, but at least the sound effects outshine it in the audio department. It only takes a few hours to complete a full playthrough of Tembo the Badass Elephant even if you have to replay levels to increase the kill counter to unlock the domes. Other than that, the only replay value comes in killing every enemy and rescuing every hostage for 100%. I'm more curious about the game's speedrun potential because it can be really satisfying running through a level with all the momentum not stopping for anything along with killing enough enemies to keep going. The roadblocks if you don't have enough kills for the requirement is the game's main problem for some even though I was able to avoid it. Besides some technical issues, Game Freak's debut on non-Nintendo systems is a solid one. If you're into old-school platformers, Tembo the Badass Elephant for $14.99 (10% off for PS Plus/XBL Gold members) is worth playing (there's a demo too if you're still on the fence).